It’s been a question I’ve heard for a month now as my co-teachers and I have planned and taught an open-ended study of “Things To Sit On.” At first, teaching preschool children about chairs, couches, stools, and other things to sit on seemed like a very dull and limiting topic but it quickly became the opposite. 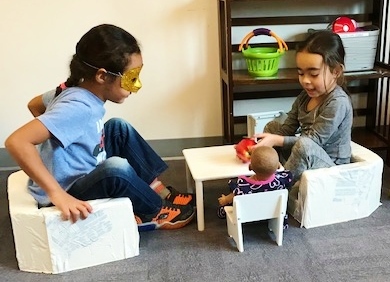 What we thought would be strictly about chairs opened the opportunity for a discussion of coping skills, safety, construction, math, comparing, and most importantly… voting. That was the true joy of this study because in the end, the children determined the path the curriculum would take. Something so basic, like things to sit on, became so much more for both the teachers and the children. I witnessed a shift in curriculum planning within my teaching team. We moved away from a conversation of “Who is going to do what” and moved towards “I noticed the kids were interested in how to take a chair apart and put it back together, is there another way we can build?” The questions we were asking each other and ourselves guided our teaching and planning. We taught children curriculum that they showed they were interested in and we suddenly felt as though we weren’t teaching a “boxed curriculum.” In fact, this study helped us incorporate some of the things we had always wanted in our classroom. In our Nature Center, we featured three large sheets of paper. One was titled “Things we KNOW about things to sit on,” the second titled “Things we WANT to know about things to sit on,” and the last called “Things we LEARNED about things to sit on.” Listening to the children develop these lists was inspiring and helped guide the curriculum planning. “Things To Sit On” was not an idea we came up with on our own. 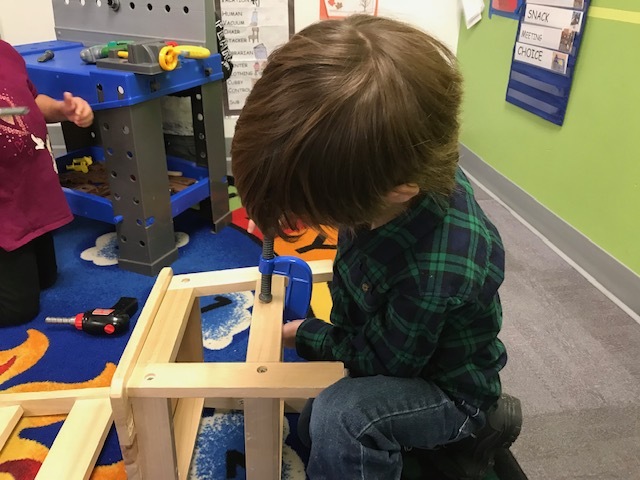 It comes from Creative Curriculum, a researched-based curriculum that is utilized by the Early Education programs through our partnership with Champlain Valley Head Start. “Things to Sit On” is something called a Study Starter. It provides a theme idea, possible book list, and activity ideas aligned to specific domains. Our team found that if a teacher chooses to implement a Creative Curriculum study exactly as written, which contains specific lesson plans for every part of the day for several weeks, it becomes constricting and feels as though the “magic of planning” is taken away. However, our team has worked to find studies that meet the needs and interests of the students and mold it to follow our own teaching styles—the ultimate best of both worlds. Creative Curriculum gives teachers activities aligned with learning objectives and resources for different studies that can then help teachers to populate data into Teaching Strategies Gold, an online-based assessment tool to monitor student growth. Along with my role as a Preschool Teacher, I also have the role of Early Education Assessment Coordinator. In this role, I am working with teachers to ensure that our curriculum planning, assessment analysis, and portfolio creation align and are a reflective practice that further benefits the teacher. By reflecting on the work we do, we begin to see these various aspects as a way to deepen our understanding of our work. We become more informed, we share progress with families in new ways, and we learn from ourselves and the work which in and of itself serves as a free professional development. Teaching to a research-based curriculum with fidelity is important for official data and determining effectiveness. Sometimes though, one must modify the curriculum to meet the needs of the teachers, classroom space, and student population and that’s exactly what our team did. This unit taught me a great deal about my teaching, what I hope to accomplish as a teacher, and how I want to continue to teach. It became clear to me very quickly that a topic as basic as this actually gave more room to come up with rich learning opportunities that encouraged students to explore concepts within various domains of learning. The students seemed to be more interested and invested in the topic because it was a concrete concept they understood. Where it might be easier to choose a topic or theme that lends itself to “Pin-tastic” crafts, this unit gave our teaching team the opportunity to develop our own activities and think critically about what we planned and how that met students where they were at. When learning parts of a chair, the students used white paper, crepe paper, and ribbon to decorate a rocking chair. On the white paper, students were encouraged to write about their favorite chair. We reviewed our safety rules of the classroom by discussing chair safety. In the hallway leading to our classroom, we encouraged families to send in photos of children sitting in their favorite chairs. This gave the students true ownership of their learning and also bridged the gap of learning at home and at school. Families became involved and were eager to ask what happened at school each day—the best part was that the children were eager to share. I believe we were teaching in a way that furthered our practice and pushed us to think harder about our planning, implementation, and analysis of learning. We were not creating a unit because “there is snow outside” (although awareness of the world around is extremely important). We didn’t look to Pinterest to find ideas of “cute” units or “crafty” art projects… perhaps a conversation for another time. As teachers, we designed and implemented a unit that was concrete so that all of our learners understood terms and were able to learn from doing and experiencing. This showed from the data that was added to our online assessment tool. Not only was the data related to specific learning opportunities over time (rather than planned observation) but there was an abundance of data to use when planning future activities. The team thought about the organization of our space and how we could use that as the “third teacher” in the room. We also found the children applying their learning outside of the explicit instruction time and applying vocabulary, routines, and ideas to other places and parts of their day. In a nutshell… yes, we taught a unit about “Things To Sit On” for a month and a half. At first it was scary. At first we thought it wouldn’t go anywhere. Now, I’m hoping we come up with another “basic” study starter idea and see where it takes us!